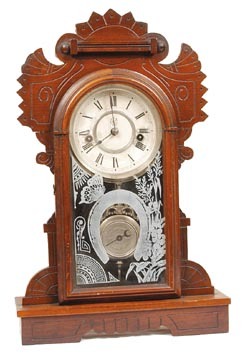 Waterbury Clock Co. miniature mantle clock, "Corona", ca 1890. This little walnut clock is only 17 inches high and the movement is only oneday. My first thought was that the clock wasnt worth the minimum, but afterexamining it top to bottom, I would say that it is near mint once you getpast the uncleaned, 110 year old case and dial. Glass is original and nearperfect, special pendulum, original key and dial, two large complete labelson the back of the case. It is hard to find clocks this original. Ly-Waterbury No. 1702.